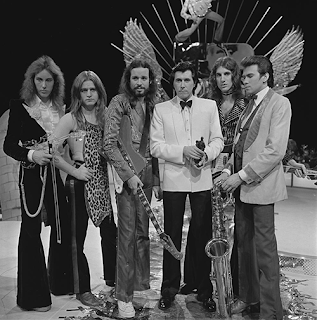 Over the years, the sound of Roxy Music (image credit) became more and more mellow, and the beautiful song Oh yeah (on the radio) is an excellent example of their later style. Taken from the 1980 album Flesh and Blood, this deceptively simple single is about a summer love affair - an everyday story of boy meets girl, in car with radio. It has always been one of the group's own favourites and I fully understand why. Their eighth top ten hit in the UK. Other songs by this act that would have qualified: Virginia plain, Take a chance with me.